Home>Window Treatments>Are Honeycomb Shades Right for You? Hunter Douglas, the leader in window fashions developed the first honeycomb shade called Duette® back in the 80s. Since then, Hunter Douglas has only improved on the design—today, the highly versatile honeycomb shades are very popular. At A Shade Above Window Fashions serving Charlotte, North Carolina, we’ll be happy to help you find out if this is the right choice for your home. Did you know that you could lose up to 50% of your home’s heating and cooling costs at the window? Energy costs keep rising, so it only makes sense to get the right treatment to help keep costs down. 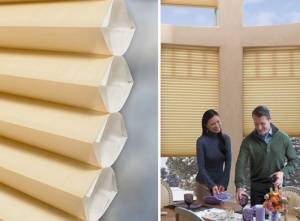 Honeycomb shades are one of the most energy-efficient window treatments on the market today. The pockets trap the cool air in the summer and warm air in the winter. These shades are available in 3/8”, ¾” and 1¼” single, double, or triple cell size for even greater energy efficiency. Honeycomb shades provide great privacy when lowered and give a room a softer feeling. They come in hundreds of colors and textures and in opacities from sheer to blackout. No matter the color you choose for the interior of the room, the backing of the shade is always white, providing great curb appeal. You can find many operating options, including cordless, retractable cord, and motorized for enhanced child and pet safety. When honeycomb shades first arrived on the scene, consumers loved the new window treatment, but wanted to have coordinating honeycomb shades for their sliding and patio doors. So Hunter Douglas turned the honeycomb fabric vertical and created a single headrail track. This product is called Vertiglide™, and it is also great as a room divider. A Shade Above is your Hunter Douglas window treatment specialists with two showrooms – one in Charlotte and one in Cornelius serving Matthews, Mint Hill, Lake Norman, Lake Wylie, Huntersville, Fort Mill, Rock Hill, Weddington, Waxhaw, Monroe, Pineville, Mooresville, Davidson, and surrounding areas.Contact us to learn more about our products and services or to schedule a free in-home design consultation. By A Shade Above|2018-02-14T17:32:29+00:00April 16th, 2016|Window Treatments|Comments Off on Are Honeycomb Shades Right for You?